Use the form below to inquire about Picturesque Hill Resort at Palchan . Use the form below to reserve for Picturesque Hill Resort at Palchan . Valley facing rooms with attached balconies. Double room with sofa in it. Pamper and rejuvenate yourself in the lap of nature at this Picturesque Hill Resort at Palchan. With a meandering river, mighty mountains, pristine valleys, and dense pine tree forests for neighbors, you would want to become a permanent resident of the Picturesque Hill Resort at Palchan. The magical mountain air in Manali is only one reason why it is so popular among tourists in every season. When it’s scorching hot in the plains in the summers, people throng the cool valleys for the pleasant weather. In winters, the snow-clad mountains lure people out of their comfort zones. Whether you want to escape the heat or experience the nip in the air with whitewashed valleys for the company, the Picturesque Hill Resort at Palchan makes for a lovely holiday abode. The accommodation at the resort is built in sync with its natural surroundings. Nestled in the lap of nature, there are 64 rooms at the resort under three categories: River Retreat (rooms facing the river), Orchard Bungalow (rooms facing the valley), and Glacier Point (rooms facing the glacier). Each of the rooms is well-appointed with comfortable furniture and upholstery and equipped with all modern amenities essential for a pleasant stay. All the rooms offer great views of either the Beas River that snakes its way around the valley, the well-manicured lawns that are the epitome of perfection, or mighty mountains that rise high to kiss the velvet sky. The in-house multi-cuisine restaurant, called Dhaam, serves some delicious local mountain fare that will keep your appetite in check. The Gazebo is the resort’s fine Italian cuisine restaurant that will satiate your craving for pasta and more. Or how an open-air barbecue at 8500 feet above sea level? The Picturesque Hill Resort at Palchan offers different holiday packages to suit your taste and needs. From rejuvenation and honeymoon packages to summer and fun ski packages, the resort has a little something for every traveler. Check-in time is 12 noon and Check-out time is 10 AM. Extra Adult- Rs. 3000/N- with an extra bed and meals. A 100% non-refundable and non-transferable advance must be paid before check-in. This amount is non-refundable both in the case of no-show and cancellation. Change in dates or the number of required rooms is treated as a cancellation. Canceling a booking 7 or less than 7 days before check-in will incur a fee equivalent to the entire booking amount. No matter how long you spend looking and admiring the beauty of the Himalayan Mountains and hills, it’s never enough. You would always wish you had a little more time to spend soaking in the serenity that abounds in the hill station. Although there’s no antidote for the love of mountains, there are a variety of activities that the resort has planned out for you. There is a skating rink and a basketball court on the property for those who want to sweat it out with sports. You could also torch those extra calories at the resort’s gym or health club. For those who would prefer to wrack their brain instead of their body, there’s chess and video games to indulge in. If you’re looking for some extra pampering during your mountain holiday, head to the resort’s spa for a soothing massage. Solang Valley is a haven for thrill seekers and adventure enthusiasts. When you want to break the spell of your siestas, put on your shoes or boots for some adrenaline-pumping activities, such as paragliding, mountain biking, river crossing, zorbing, river rafting, rock climbing, and much more. For a moment of quiet contemplation, go on a nature walk and listen to the birds chirping, the river gushing, the trees swishing and swaying, and all the other sounds of nature that get lost behind the honks and other city noises. The nearest domestic airport from the resort is the Kullu-Manali Airport in Bhuntar, which is 61 km away. Weather permitting, there are daily flights from this airport to New Delhi and Chandigarh. The airport at Chandigarh (330 km) is another option for air travelers. Joginder Nagar (170 km) is the nearest railway station from Manali that connects this hill station to a number of other important cities. Chandigarh (326 km) and Ambala (351 km) are the other railheads you can consider. 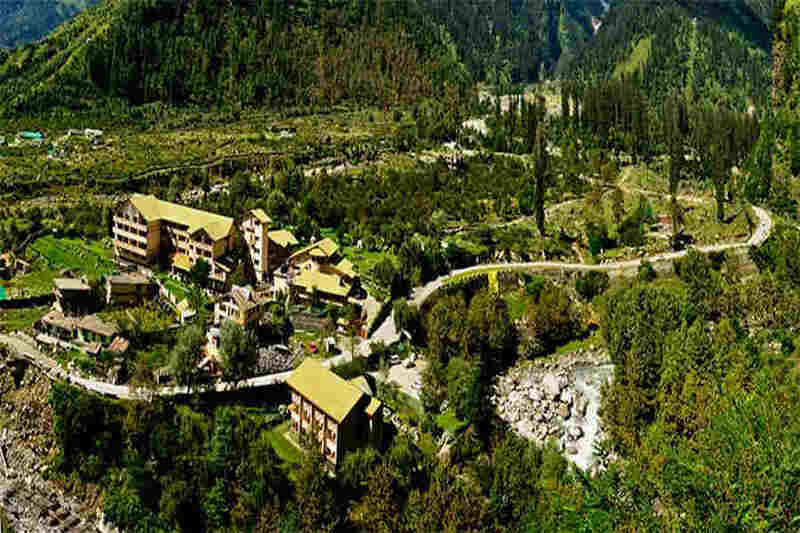 The main Manali town is 11 km away from Palchan. The region is connected to major cities, such as Delhi (548 km), Shimla (259 km), and Chandigarh (320 km) by a network of state and national highways. Palampur (187 km), Dharamsala (246 km), and Solan (256 km) are a few nearby attractions.